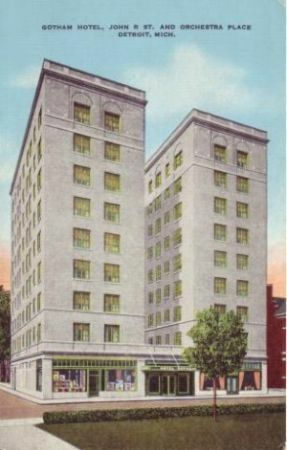 The Gotham Hotel in Detroit, Michigan was an example of the intersection between legitimate business and illicit enterprise in the Jim Crow era. The hotel was originally founded to provide a social and business center for local black professionals and a place of accommodation for visiting dignitaries who were unwelcome in downtown hotels. In November 1943, Gotham’s founder and first owners, John White and Irving Roane, two local black entrepreneurs, teamed to purchase the nine-story hotel at the corner of John R Street and Orchestra Place from Albert Hartz, a Danish businessman. For the next two decades the Gotham hosted visiting black dignitaries and celebrities from around the world while simultaneously providing black Detroiters with a clean, comfortable facility for staging dinners as well as public and private social events. During its first decade the Gotham boasted that it provided accommodations for many of the most prominent African Americans in business, sports, and entertainment. Its guest list included Jesse Owens, Jackie Robinson, Joe Louis, B.B. King, Adam Clayton Powell, Jr., Count Basie, Langston Hughes, Sammy Davis, Jr., and Billie Holiday as regular visitors. Yet like many businessmen in the black urban economy, John White was also a gambler who played the numbers and by the 1950s when hotel revenues were declining, reserved the top floor penthouse of the hotel for gambling. Prominent white and black politicians as well as Detroit police detectives frequented the hotel during this period and presumably knew about the hotel’s reputation as a place for gambling. Nonetheless, they looked the other way. The FBI and Detroit Police Commissioner George Edwards, however, were determined to end the hotel’s illegal activities. Losing money from its legitimate enterprise, providing accommodations for visitors and facilities for local groups, the hotel officially closed for business in September 1962. Four months later in December 1962, over a hundred federal agents, state troopers, and the Detroit police officers raided a gambling den in the vacant hotel and arrested 42 people including the owner, John White. At the time this was the largest gambling raid in Detroit’s history. Police claimed the hotel was the center of a gambling operation that netted as much as $30 million a year. Two years later, in July 1964, the Gotham was demolished ostensibly to create room for “urban renewal” projects such as Lafayette Park, the Chrysler Freeway, and the Elmwood housing project to replace old neighborhood housing and modernize transportation in the area. Today, however, the hotel’s former location at John R and Orchestra Place still stands vacant. Vivian Baulch, “Paradise Valley and Black Bottom,” The Detroit News; Ernest Borden, Detroit’s Paradise Valley (Chicago: Arcadia Publishing, 2003); “15 in Gotham Hotel Raid Found Guilty. Repercussions from the Nov. 9 raid on the Gotham Hotel,” Detroit Courier News, January 12, 1963, 1-3; Luther Webb, “Urban Renewal Price Was Expected to be $500,000,” Detroit Courier News, May 18, 1963, 1 & 16; and Mary Strolberg, Bridging the River of Hatred: the Pioneering Efforts of Detroit Police Commissioner George Edwards (Detroit: Wayne State University Press, 1998).